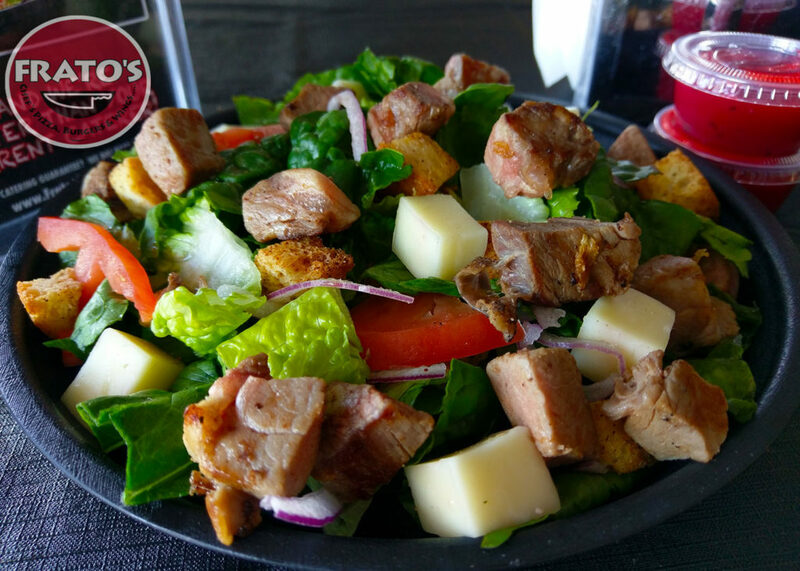 Specialty Salad made with a blend of Hand-torn Lettuce and Baby Spinach, Homemade Garlic Seasoned Croutons, Sliced Tomato, Diced Wisconsin Whole Milk Mozzarella, Hand-sliced Prime Rib Chunks topped with Homemade Raspberry Balsamic Dressing. Grilled Chicken, Smoked Applewood Bacon, Wisconsin Blue Cheese, Hard Boiled Egg, Macaroni Pasta, Red Onion & Sliced Tomato. Lettuce, Sliced Celery, Shredded Carrots, Wisconsin Blue Cheese & Pepper Jack Cheese. Topped with Fresh Handcut Buffalo Wings. Tri-color pasta salad with housemade Italian dressing, tomatoes, black olives, celery, Parmesan cheese.